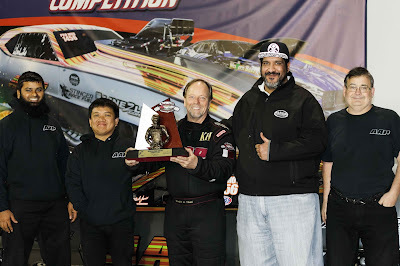 Home > ADRL > AlAnabi Racing > DragRace > News > NHRA > Qatar Racing Club > Mike Janis Superchargers with a first back-to-back Pro Mod win in over 20years! The MJR Superchargers and team have been in Qatar for a close 3 weeks preparing cars for the NHRA kick and racing at the Qatar's biggest and only Pro Mod racing event! ''I have never had a back to back championship in probably 20yrs. This car is running pretty consistent. Last week we got my son tuning and this week we got KH tuning it - Mike Janis speaking to our team in Qatar"
In the mid 2017,Mike Janis Racing Team partnered with Qatar's Al Anabi Performance team and have been racing at the NHRA with this very AAP most violent blown Camaro running most of the races at the NHRA events! They shipped the car and a team of three straight to Qatar when the NHRA season ended. They arrived in Doha and kick-started their campaign of their first ever overseas racing under the sponsorship of H.E Sheikh Khalid Bin Hamad Al Thani. 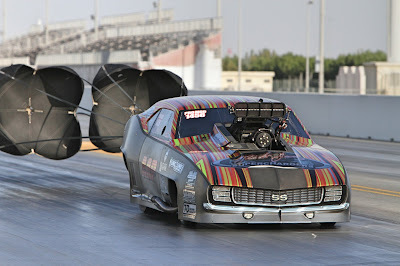 They ran a 5.71s pass (1/4 mile) in testing and they have been consistently hitting 3.7s at the 1/8th mile ever since! Qatar Racing Club has of today announced dates and schedule for Round 3 of the Arabian Drag Racing Competition. The third round will witness Mike Castellana, Kuwaiti drag racer Khorchid, Mike Janis and Todd Tutterow battle it out as MJR team seek a third title in the championship this season in Qatar!